Australia is cruise crazy, so what's the attraction? Our guides are shipped off on a 10 day island hopping South Pacific adventure, to discover exactly why it's our favourite kind of holiday. 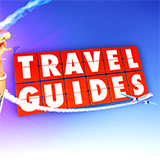 Travel Guides was broadcast on Channel 9 at Monday 16 April 2018, 22:52. Travel Guides is an Australian television series about six groups of Australian people who become full-out travel critics over the period of one week. The groups are sent to a national or international holiday destination where their job is to review everything the trip has to offer, from accommodation and local delicacies to local sights and attractions. The holiday destinations vary enormously, from Oman and Tokyo (Japan) to the Gold Coast and a cruise on the Pacific. The idea of Travel Guides is to show the ordinary Australian holiday destinations reviewed by other ordinary Australians. A major part of the comedy is the concept that one person's paradise may seem like another person's personal hell.